The second in a series (Against the Brotherhood, 1997) featuring Sherlock Holmes’s brother Mycroft, a high-level diplomatic agent for England’s Admiralty, whose present assignment is to facilitate the signing of an agreement with Japan—an agreement that would guarantee England’s influence in Japanese-controlled waters and also increase the number of Japanese students accepted at England’s Dartmouth Naval Academy. 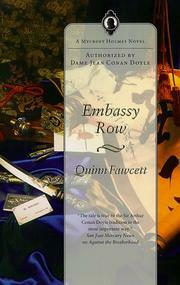 Mycroft is aided by his secretary Guthrie, manservant Tyers, and actor Edmund Sutton, who convincingly masquerades as Mycroft, allowing his master to participate in secret meetings at the Swiss embassy with Japan’s Ambassador Tichigi and his secretaries Minato and Banadaichi, among others. It’s Mycroft who finds the body of Lord Edward Brackenheath, stabbed to death at the foot of the embassy’s terrace steps. Brackenheath, a wastrel and one of the conservatives opposing any ties to Japan, was married to Lady Francesca, an heiress and (as Mycroft is to discover) the secret lover of Japan’s Prince Jiro, a student at Dartmouth. Matters are further complicated by attacks on Sutton and Guthrie—the latter saved by Penelope Gatspy of the Golden Lodge. The solution, like most of what has gone before, is wordy, complex, and unconvincing. No treat here for Sherlock enthusiasts.